Bet you’ve got no idea how many different events and activities take place at Cleveleys Community Centre – have a look and find out! 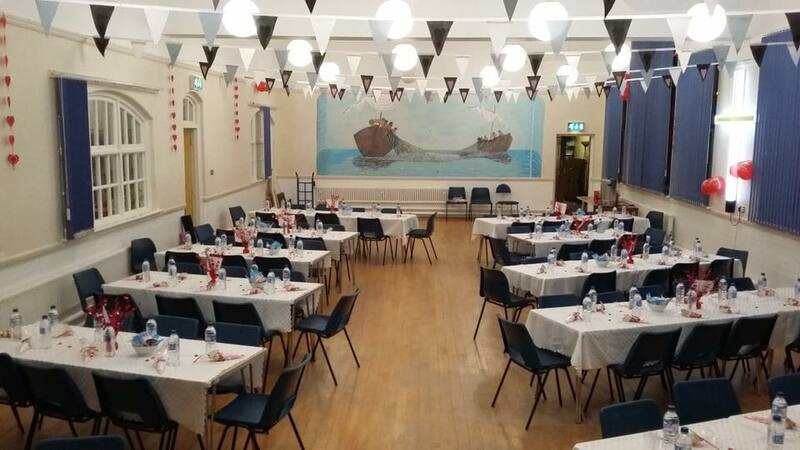 There are function rooms to hire from the large hall with a stage which holds over 100, to smaller rooms for groups, meetings and classes. Very reasonable rates. Kitchen facility or catering available. Disabled access and toilet. Large free car park. From 10:30am throughout the week and on Sundays, the building is open for you to visit and enjoy a great meal and a drink at the Beach cafe. Call 01253 863369 for more details and to book a room. 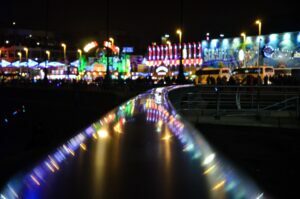 Please mention you saw it on Visit Fylde Coast! Cleveleys Community Church Centre is having a Facelift! Cleveleys Coastal Community Team (CCT) has been helping to get the Centre ship-shape for the coming year! It’s a precious local building and the CCT intend it to reach its full potential as a true hub of the community. The Coastal Community Team has secured the help of our friends at HMP Kirkham to decorate the inside of the building for them. One room is finished and looks bright and cheerful, and lovely and clean. Even the floor’s clean and polished. It will be amazing when it’s all done – well done guys ? The building is run by the community for the community and and surplus from room hire costs is put towards improving the building. Eg you might have noticed that the windows have been replaced – which isn’t a cheap job. new curtains across the stage (or even dry cleaning the ones that are there). Furnishings/fabrics/hangings or even carpet to deaden the sound at meetings – currently it’s a very rattly space. There’s outside work that needs doing, for example gutters and (dare we say it) the roof needs attention. (It looks like it’s got ‘nail fatigue’ ie they’re old and done for). We’d like to set up a computer room so will need second hand kit, tables and chairs. There are lots of other things that are needed if you want to volunteer anything else. Cleveleys in Bloom want to make the outside bright and cheerful so they’ll need planters, plants, materials and more. The CCT has a cunning plan for signage to direct people from the town centre to the building. Have you got a local business or organisation who could help with any of this?  Come on Cleveleys, you can do it – we’ll make sure that any businesses who do help get recognised and a warm glow of satisfaction is guaranteed ? This is just a sample of the type of events that are held each week at the Centre. Please check for what’s on this week. 10.30am – 12noon Cleveleys Community Church. Elim Pentecostal church. Visitors welcome. Plus monthly groups like Rossall Beach Residents & Community Group who meet here every fourth Wednesday. Come and take a look! 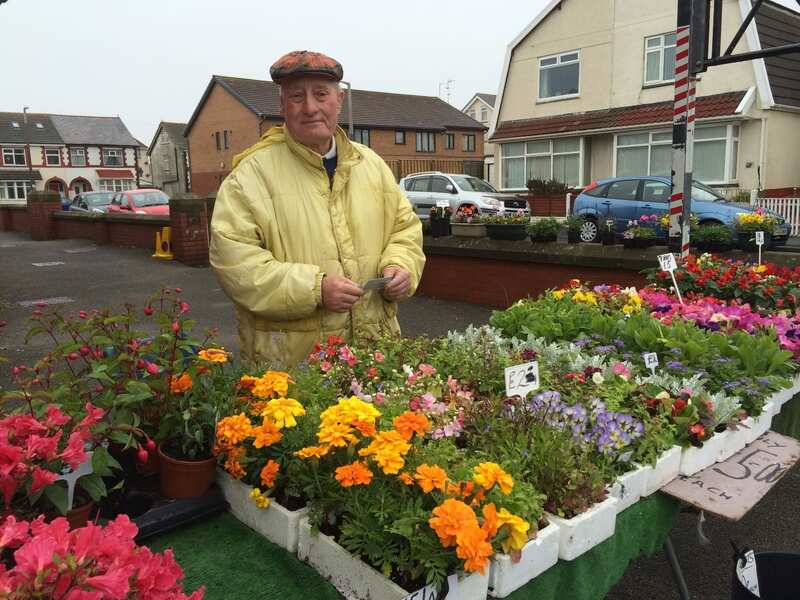 This is Mr Holme, he grows all his own plants in greenhouses at home, and sells them from the car park at Cleveleys Community Centre. A selection of bedding plants and perennials available to suit the seasons. On Saturday’s according to the season, from 9am. Call round and get a few flowers to brighten up your garden. Bring your hanging baskets along and get them refilled. This page is for information about weekly groups and special events at our centre on Beach Road. Rooms are available at very reasonable rates for a one-off event or a weekly group, from 2 people to 100 people. Large car park on site. Disabled access and toilet. Catering available. Come and check us out, there is something for everyone: from Dance Classes, Weight Watchers, Art classes, Amateur Radio, Dog Training, Yoga, Line Dancing and youth club. Reasonable rates for classes, parties and events, either a one-off occasion or regular booking. Need somewhere to hold your meetings? We have rooms at very reasonable rates… Kitchen facilities available. Disabled access and facilities. Different sizes of rooms available. You can also hire a room for a couple of hours on a one off occasion – you don’t have to have a regular booking. This is ideal for fundraising, launches for new businesses, AGMs, plays and productions and all kinds of events. 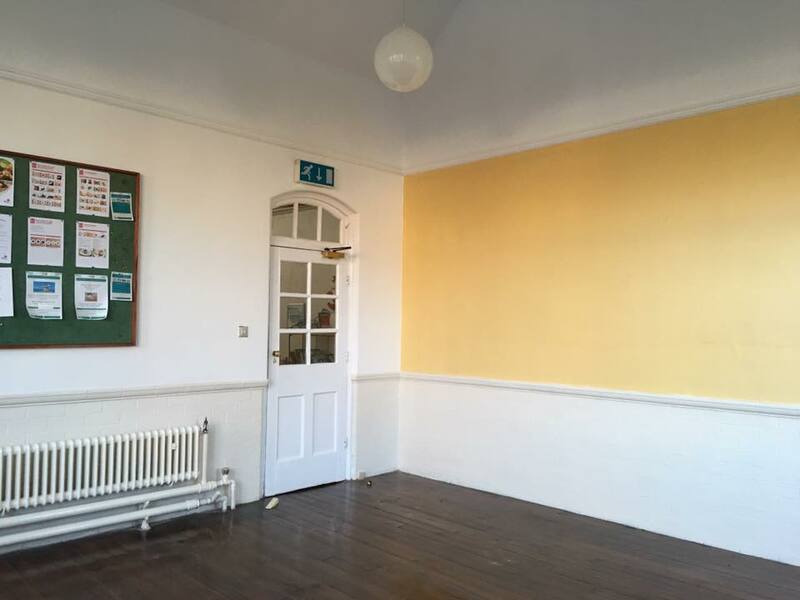 One room holds up to 30 people arranged in rows, another two rooms can be used separately with up to 30 people each or opened up into one bigger room, and the hall is suitable for large public meetings of up to 100 people. Catering facilities can be arranged and provided. Non perishable foods only please – even the smallest donation is gratefully received. Just drop your donation off at Cleveleys Community Church Centre – at the back of the car park/off Beach Road. Cleveleys Community Church Centre is owned and managed by a team of volunteers with the aim of being at the centre of the community. It’s about providing a place for people to go and make friends, to join in with different activities and events, have a bite to eat and a brew, and just generally feel at home and find someone to have a natter to and something to do. If you’re looking for something to do they’re always on the lookout for people who can volunteer an hour or two of their time each week to help with the community centre activities. Jobs like locking up and unlocking the building, tidying, office duties and generally being on hand to help. If you’d like to be part of the team please get in touch and find out more. 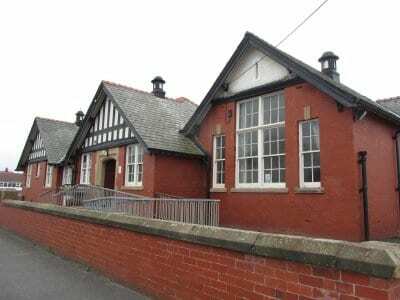 It was built as Beach Road School and later converted to the Frank Townend Community Centre. Cleveleys Community Church Centre bought the building in early 2016. Cleveleys Community Church is an Elim Pentecostal church and a member of Groundlevel churches. Meetings are held here during the week including prayer meetings, Bible studies and Alpha courses. Our meetings are every Sunday morning at 10.30am and at 6pm. Check out our Facebook page for up-to-date information and news. Sunday Services at Cleveleys Community Church comprise of powerful worship and a life changing message. Both are consistent with today’s culture. Worship is led by a live band and will occasionally involve drama and performing arts. The Life Changing messages are mostly focused on applying the Bible to everyday lives. Children are very welcome, bring them along with you! The preaching style is always personal and very relational. Communion is shared monthly and throughout the year there are baptisms, child-dedication and membership enrolment services. If you are attending Cleveleys Community Church for the first time, you will be very welcome. Stop for a chat and a coffee after the service in the foyer coffee bar, or come down before the service from 10am for a slice of toast and a brew. Pastor Stephen Scholes is the Senior Pastor of Cleveleys Community Church. Together with his wife Debbie and the leadership team they organise a full diary of activities both for the church and the Community Centre. Together as a church, they adopt the standard Evangelical Statement of Faith. Main meeting every Sunday morning at 10.30am and again at 6pm. Enjoy refreshments before and after the meeting. Visitors very welcome. ALPHA course Want to learn about the Christian faith in an informal, friendly discussion group? Next course starts later this year…. Once the Frank Townend Centre, the former primary school building on Beach Road is now Cleveleys Community Church Centre. Cleveleys Community Centre took over management of the venue in 2010 from Wyre Council while they retained responsibility for maintenance and repairs. They bought the premises in March 2016, to make sure it continues in its vital role as the heart of the community and a meeting place, offering something for everyone with varied classes and activities. The partnership has been a great success with community usage increasing greatly in the years since and a wide range of classes and activities for all ages now on offer, along with room hire and catering facilities. The deal includes a restriction on the future of the centre to community use only under the Local Government Act 1972, which allows local authorities to dispose of property for less than normal market value where it will help secure the social wellbeing of the area. As a result the building was valued as a community asset and sold as such, freeing up funds to finance future council spending. The sale was finalised in March 2016. There are groups and classes here for all kinds of things. There are art and dancing classes, Residents groups, police and public meetings, dog obedience – you’ll find something for everyone and all the groups who use the building are always looking for new members!